Ashtead LMS ashtray - 4¼" (107 mm) diameter, 1" (25 mm) high. 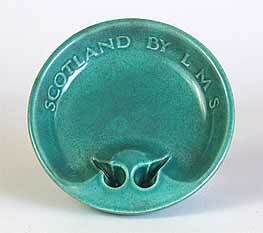 LMS stood for London, Midland and Scottish. It was one of the big four rail companies after the merger of all the smaller lines following the end of WW1 and before British Railways was formed in 1948. This is Ashtead Potters' patented Cho-kr design. See Ashtead 'Cho-kr' ash tray for a variation in design.